The ANG 5000 Series offers the most flexible architecture available in an automated white Gaussian noise generator. 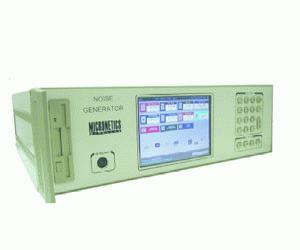 The intuitive graphical interface, color LCD display and remote control interfaces (GPIB or RS/232) allow the user to easily set or program precise levels of noise. Adding options such as input signal combiner and signal/noise path filtering allows the ANG5000 to be configured to perform more advanced testing like signal to noise or carrier to noise ratios.